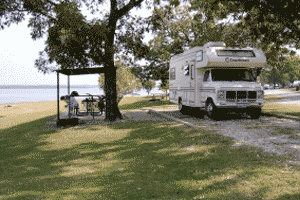 A Corp of Engineers operated campground, Juniper Point Campgrounds are located on the Texas side of Lake Texoma off Hwy 377, close to Gordonville. The campground is on both sides of the highway as the highway enters the Willis Bridge crossing into Oklahoma. Juniper Point east side access is a controlled entrance park. The Juniper Point west side access is where the trailhead for the Cross Timbers hiking trail is located. General stores and a marina are within one mile. Juniper Point Campground contains 48 sites, 44 with standard electric hoop-ups, 3 tent only non-electrical sites, with flush and vault toilets, showers and drinking waters, Picnic areas, hiking trails with trailheads and group picnic shelters with electricity. Two dump stations, two boat ramps and two docks are located in the campground. October 1st through March 31st: Reduced camping will be available on a first-come, first-served basis (no reservations are accepted) in Juniper Point West only. Juniper Point East will be closed during this period. Campers should use Juniper Point West for overnight camping and boat launching. Shower and bathroom facilities will not be open and individual water hookups will only be available through October 31st; after this date campers will need to fill fresh water tanks from the frost free hydrant located near entrance of park. Gate attendants will not be on duty; therefore, camping fees should be paid at the honor vault station. Camping fees will be reduced and are posted at the vault station. Please contact the Lake Texoma Project office at (903) 465-4990 x 0 for additional information.